Dream Theater will be performing Live at Salle Wilfrid Pelletier in Montreal on April 5th, same month and venue for the Nick Mason show. Last time for me was at the Oakland Fox Theater in 2016, I felt that something was missing after seeing the whole Astonishing album performed Live. it's amazing how its come to the point I look forward to the interviews more than the new album, lol. He forgot to introduce Petrucci's and Rudess's beards, undoubtedly the largest personalities in the room! Wow, that interview said exactly nothing, apart from the fact that they're all isolated somewhere like, say, Rush in the late seventies. I'm not too surprised that the tendency is to be more tight-lipped about albums considering all the file-sharing horrors that have been in place in the last two decades, but it's kind of pointless to have an interview where the answers are all vague generalities that could apply to any band writing an album. I liked the self-titled album more than I expected, considering the three prior albums were so underwhelming (Black Clouds being the worst; no wonder Mike Portnoy wanted a break). "Illumination Theory" hit all the DT buttons but featured enough new and interesting stuff to make me listen to it again and again. Even the guitar/keyboard solo trades seemed to work for me. Then The Astonishing came out, and I couldn't get past the third-grade-notebook-scribbles cheesiness of the concept, so I never bought it. Reviews here haven't been that kind either, though maybe if I'm bored enough I'll get that abbreviated version someone created above. But for a couple of years I'd thought I'd pretty much given up on them. But I dunno. I've mellowed a bit. I do really like Rudess's skills, even kept in check as they usually are on DT albums. I may get this one for old times' sake, even though I'm not expecting miracles. For some reason, the clean simplicity of the cover makes me smile and think, "Ah... what the hell. Just expect the usual DT and it'll be okay." Listening tonight to James LaBrie's album Static Impulse, it's really quite good! It's got the melodies and hooks, with solid players and songwriting. It's kind of nice to hear him in a more conventional format, without all the bells, whistles and excesses of DT. I really enjoyed this one, and had forgotten how good it was (I bought one of those budget multi-disc boxes called Discovering James LaBrie featuring three of his albums a while back.) I certainly prefer it to the last three DT albums, to be honest. The self-titled is the best of the three, IMO. I think The Enemy Inside is a great track and there are a few others in there that sound pretty good, particularly the first two-thirds of Illumination Theory. The last third or so of that track is the cringeworthy lighter-waving stuff that their epics often devolve into (and The Astonishing was about two hours or so of that.) Overall the album has its moments but it ultimately loses something for me when I have to stop it before it's over. As for ADTOE, I just find it a tough listen all the way through... a few of the epics have some solid moments, of course. But there's a lot of the endless wankery that I know appeals to some people, but doesn't appeal to me. It feels overlong and bloated. I'd be curious to know what the band thinks of it now, actually. On The Backs Of Angels is a decent opener though. Maybe I'll play both of those albums again soon. It's definitely been a while for ADTOE, perhaps some of it will appeal more now, for whatever reason - that's happened before with plenty of other bands/albums. This thread made me play ADTOE and The Astonishing, really enjoyed both, DT 12 next. Breaking All Illusions is my fave ever DT track , just incredible. Sorry, but Black Clouds I find pretty much better than every record since Octavarium. Splitting hairs a bit, but I find they haven't made 2 better tracks than The Count of Tuscany and The Best of Times since. Good Lord. He's like the worst singer ever. Awful. Self-titled was the best DT album since Falling into Infinity, in my opinion. Some of the best and most focused songwriting they've done in a long time. ADTOE had some good ideas, but most of the songs were horribly padded out with endless wankery that didn't really seem to go anywhere. Kind of a tough slog to get through. And then there's The Astonishing...I'd prefer to forget that ever existed. It'll be interesting to see where they go with this new one. Really? I've heard alot worse. I disagree, I used to think that until I actually listened to DT. James is the only member who has truly improved their craft. Sure John plays faster and Jordan is crafting technology, but the singer Labrie is today is way better than the screecher on I&W, IMO. True, but that doesn't necessarily translate in to good or great. Kris Kristofferson is better today than when he first started, but he still sings pretty badly imo. Actually, I always thought James sings out of his range and I cringe at times when he tries hitting those higher notes. But there are some songs when he sings softer and within his normal range and I think he's got a pretty darn good voice. This reminds of something that's bugged me for a while: having watched the Images and Words Live in Tokyo dvd relatively recently, I would LOVE to have that John Petrucci back; the one who could shred like a mother**ker but often chose not to (or at least to nowhere near the same extent as now). It also served to illustrate that JP's tone with that Ibanez of his was often way better than the wall-of sludge sound he seems to prefer from his Musicman, even though the latter's a lovely instrument. Did the NY Times Magazine steal the cover? ^ When is the Times magazine from? The moment when JM and JP got sponsorship deals for 5 and 7 string instruments is when the tone and audibility of their instruments began to suffer. The Sludge Beginneth. For example - just heard Innocence Faded live on Pandora but its Mangini era and the ending jamout is twice the speed it was in studio, with half the tone and none of the melodic elements (due to crap tone and tempo blazing). This one's going to be a game-changer isn't it? It'll either pull back in those fans who were disappointed with The Astonishing, or it'll turn away even more fans because it fails to break new ground. It can't possibly live up to the expectations that it'll be in the same league as Images, at least not without a further 20 years of appreciation. And it sounds like the PR campaign is stalling already, judging by the reactions to the latest interview. I admit I'm one of those sitting on the fence, not ready to judge until I've heard it, but I'm not in any hurry to buy it either. It'll be fascinating to see how this plays out.......(maybe if sales tank, they'll issue a special edition titled "The Fascinating"
have some artwork of Spock. 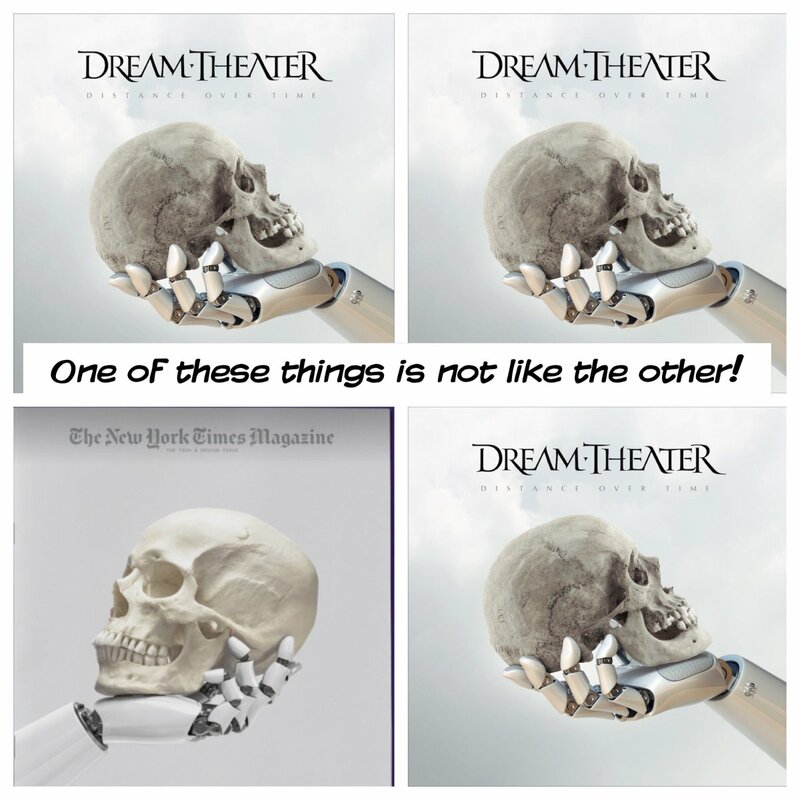 Dream Theater probably bought the rights from the artist.